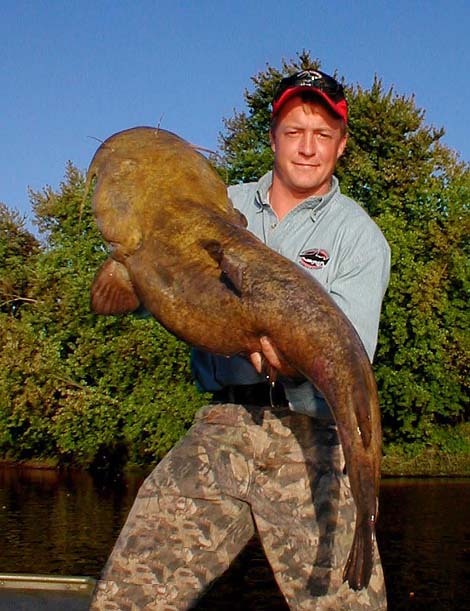 Chicago Fishing Reports | Chicago Fishing Forums • View topic - Monster Flathead! Fished with legendary flathead guide Denny Halgren on the Rock River this fall. We caught 8 flatheads that day and missed 2 this one was the biggest of the day!. 6 inch green sunfish, 20 lb stren line, 3oz egg sinker, graphite procat rod, 5/0 tru turn hook. I'll never brag about an 8lb Bass again...ever! How much did that sucker weigh, Tim? Last edited by Bucket Face on 07:57am - May 4,03, edited 1 time in total. Wow That is some fish. If I ever managed to catch one like that I'd get all nervous, then mess something up and lose it before getting it in the boat for a picture! Then would have to go around getting that "another one that got away" look when i tried to brag about it! LOL. Tim I read on Denny's page that when you fish for flat heads the line will go about 3' out then stop then you wait up to 10 minutes b-4 a flat will thenn start screaming line? Is this normal procedure to wait to set the hook on flats or is Denny putting a little ad in his ad? If this is the norm why cant you set the hook in the first run? What is the flat doing with the bait? Man I have alot of ? 's dont I? That little "scenario" he has on his site is just one of the ways a flathead bite happens. You have to realize that Denny's customers set the hook themselves and may not have ever fished for catfish of any kind in their entire lives so he has to be aware of the angling skills of each customer who fishes in his boat in relative short order. Flatheads are sometimes one of the most difficult fish to target even for someone of Denny's experience and expertise. Flatheads will act differently day to day and hour to hour so one can never be sure when to set the hook until you've experienced lots of hits and caught lots of fish. His "patented" daytime pattern is one of the most interesting and technical approaches to any flathead fishing on the continent (not that others arent doing it) but.... most of his hits in a day will come from accurately pinpointing fish who are holding on cover during the day and will most of the time be in a "passive" or neutral feeding mood. Denny's pattern actually forces big flatheads to strike by taking advantage of the fish's territorial agressive behavior. He puts the bait so close to the fish's "spot" that his personal space is invaded and a strike occurs eventually. Maybe one minute or 15 minutes of a baitfish struggling in the flatheads spatial zone... the flathead dispatches the bait. Sometimes they arent even feeding ... just moving the baits or "spanking" the bait (so to speak) sounds strange but it is true. IF... the fish is agressively feeding ewven during the day they will go on short runs or hit baits on a flat adjacent to a hole or current break then go back to their holding area. Flathead bites come in a whole host of different intensities and they rarely move far with the bait... Screaming the clicker? They rarely scream a clicker... more of a steady move off... the bursts of clicks and pauses are when the rods loads up then straightens again giving you the appearance they are making short bursts. The rod does pump while the fish is swimming because each pump is when the tail moves one way the head moves the other way and usually the longer the pump of the rod tip the bigger the fish is... just wavwlength math but kinda neat when ya think about it. I usually set the hook on the first run after I'm confident the fish has made a definitive choice about the bait... I can usually tell a tentative hit and wait just long enough for the fish to hit a second time or not give the fish a chance to feel pressure from the rod before spitting the bait... it happens though I try not to let it happen much. All this may sound like hieroglyphics to ya but if you spend thetime on the water and deal with many different bites and activity levels of the fish and a whole host of other things youll get it figured out... and just when ya think you've got flatheads figured out and are mastering them to a t... they will humble you on at least a few days a year. They simply wont bite no matter what ... they will spit baits... move baits and drop them .. etc. What a challenge they truely are! Chitown-Angler was started on February 10, 2003 and has received 207434318 page views in total since that date.